My guest this week, Jean Myles, blogs as Mommy to Two Boys, and she is another amazing Autism Mom. She writes about her family: her four year old son, Jaylen, who is on the autism spectrum, and his younger brother, Xavier, who is not. 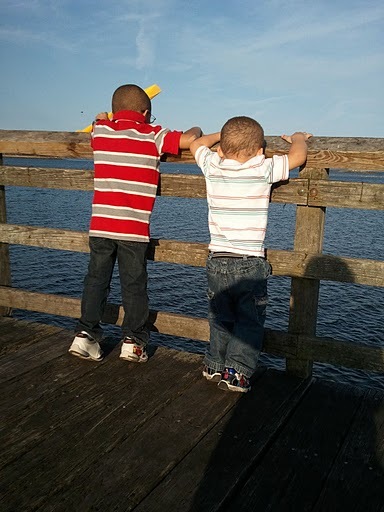 Jean also takes beautiful pictures of her sons, and they are all over her blog, woven throughout her posts. I rubbed my pregnant belly as I heard the words for the very first time, "Jaylen has Autism." Would this baby have Autism? How am I going to give Jaylen all the help he needs yet still take care of another child? Should we have stopped at one child? Xavier was born four months later, and aside from some sensory issues and being a total brat, he has turned out to be exactly what our family needed. There have been some very rough times as their brotherly love matures, but there have been some amazing moments at well. I know there will be hurdles to overcome in the future, but I feel strongly their bond will strengthen over time. A solid connection is what surprises me most about how my boys interact. Jaylen, my ASD 4 year old, is truly lacking in social skills, empathy, and play skills, so to see them communicate, play together and understand each other blows my mind. I always thought Jaylen would remain in a shell and Xavier would be left without a companion, but instead their worlds intersect a lot. Jaylen never seemed to notice or care when I got upset, my husband and I fought, or if we were trying to include him in play. Xavi is the complete opposite, a personable, always in your face 2 year old. It breaks my heart when Jaylen gets home from school and Xavi cheerfully yells, "Hi Jaylen!" only to get no response most days. However, I am slowly watching their relationship evolve. They communicate in their own way. They order each other to do things, ask each other to play, and have started ganging up to defend each other. Recently they played together for 39 minutes without a problem. I am not sure how much interacting really occurred, but I heard them laughing and talking. It is still interaction, even though half the time they spend together they are fighting. For never having seen a single WWE event, they sure know some serious moves and use them often. Blood has been drawn, bruises have been made, and many tears have fallen because of their extreme physical contact. My husband swears this is normal boy behavior, which I know nothing about since I grew up in a house of three girls. Jaylen and Xavier are on the same level when it comes to certain skills. Pretend play is one area Jaylen still really struggles with so they are learning the skill together. Even though all we have seen is play-kitchen cooking, car and train scenes, and hours of school buses picking up and dropping off kids, I can easily see it progressing. Xavi lost his lovey at Stop and Shop and Jaylen got upset, "Oh no, is he going to be sad?" I looked at Xavi and replied, "No, he seems OK. He isn't crying, but will probably be sad at bedtime." I watched Jaylen stare blankly as he processed what I said, then explained, "No Mom, not Xavi. I was talking about Lovey. Will Lovey be sad and lonely here at Stop and Shop?" Oh well, so much for empathy for humans over inanimate objects, but we will get there. Thank you, Jean, for sharing the lovely, complex, growing, sometimes difficult relationship that exists between your two boys. I am especially touched that they have "started ganging up to defend each other," think that bodes well for their future. Now that you have read this lovely post, you are going to want to follow Jean home to Mommy to Two Boys and read her there. May I recommend this post or this one about the surprises of parenting a typical toddler after an ASD first child. Or this lovely post about her son riding the "short bus." Jean can also be found posting about her work-from-home business on her work blog. Finally, you can and *should* follow her on Twitter and like her on Facebook. Happy Reading!